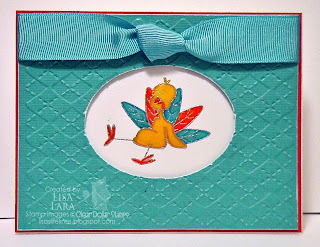 I used this adorable new release LET US GOBBLE TOGETHER from CLEAR DOLLAR STAMPS. This stamp set was designed Guest Designer Heather Rolin. Are you up for the challenge? I sure felt like my MOJO was lacking when I was trying to come up with something with these colors. Ever have that? You think and think and think and just feel that you are settling? Well, I really did my best, but am not totally happy with it. Happy enough to post it but the inspiration just did not want to come easily, my goodness. I hope you will join us this weekend. Thank you for Visiting!! AWWWW Lisa that is one CUTE CUTE little guy!!! Your colors are SOOOOO pretty!!!!! Isnt it funny when we arent so happy with our cards, but post them anyway, they seem to be a blog world fav? I love this card! I think it is genious! And I do know what you mean, I have had three colors sitting on my table for a week now, and I am still not inspired to create with them! 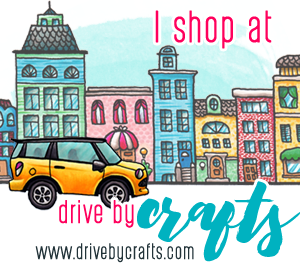 Love your card and colors! Thank you!! I love the card and the colors! I think this little stuffed turkey is my favorite image from the set. This is a great card Lisa. Thanks for sending the sunshine! If I see your mojo trying to sneak through my yard, I'll trap it and send it back! 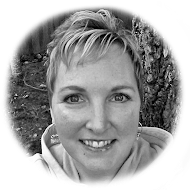 Hubby just drew your name for the nutcracker tag from my blog. Send me your addy girl and I will drop it in the mail. Cute! The colors really pop! Love it Lisa! Lisa this is adorable.. What do you mean...I think these colors are terrific together.. I wish I could have played.. Congrats on winning Trudy's tag...You go girl..hugs. Hope you are feeling better too.